TFD » Blog » Posts tagged "spring wedding flower ideas"
At Todich Floral Design we love working on spring wedding flowers in London. Spring is a lovely time of year to get married as it typically symbolises rebirth, life, growth and purity as trees, plants and flowers start coming back to life following the cold winter months. We have a huge number of spring wedding flower ideas for 2014. From beautiful wedding bridal bouquets with flowers that have really striking attributes and shapes, to bridesmaids flowers in a huge variety of colours that will perfectly complement their dress. 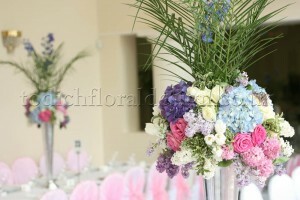 Whatever your style or colour scheme, we can offer expert advice on the perfect wedding flowers for your big day. Agapanthus (a large, striking flower, also known as the African Lily), Anemones (delicate flowers which come in various colours), Bouvardia (which can have either singular or double star-like blooms which open from tube-like necks), Calla Lilies (pictured here and a popular choice for spring wedding flowers), Cornflowers (also known as Centaurea Cyanus and available in a bright blue, or hot pink) Delphiniums (which have tall stems with multiple delicate flower heads), Gloriosa (a type of lily which is a dramatic yellow and dark pink), Hyacinths (wonderfully scented and available in a number of colours), Iris (which have long, straight flowering stems), Lilies (large prominent flowers with a beautiful fragrance), Lily of the Valley (gorgeous tiny bell-like flowers), Narcissus (daffodils), Orchids (which can have up to 12 flowers on one stem), Sunflowers (large, cheerful yellow flowers), Sweet Peas (which have a wonderful selection of colours and scents) and Tulips (a popular spring flower available in a number of colours). No matter what your taste or style, spring brides are spoilt for choice, whether you’re after lots of bright splashes of colour or pretty pastel hues. Our team of expert designers specialise in working with brides to help them create their perfect wedding bouquet and can offer plenty of tips and advice on spring wedding flower ideas. Our florists bring with them a wealth of experience and can provide guidance on bridal bouquet designs and wedding flowers that will complement the dress, theme, colour scheme, personality and style of the couple and their wedding. Spring wedding colours and spring wedding ideas can range from pretty pastels to bright constrasting hues and nice designs can include touches of blossom, tulips, and other sweetly fragranced seasonal blooms, as well as flowering bulbs in pots. For ceremonies and receptions that may be held in full or part outside, the addition of a lovely floral arch is a nice touch for spring too, or perhaps flowers, fairylights or hanging pomanders to decorate bushes or trees in gardens or grounds. 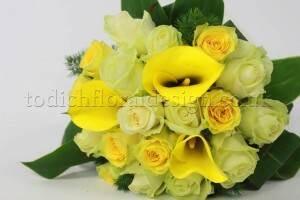 A bridesmaid bouquet will usually mirror and complement the bride’s flowers, but they don’t need to match exactly. Bridesmaids’ flowers can come in a variety of styles and shapes, from a traditional round posy, cascading bouquets, teardrop bouquets, heart-shaped flower bouquets, oval bouquets, loose round hand-tieds or even custom designs. Our dedicated florists are there every step of the way to help with flower ideas for a spring wedding and to ensure all the designs complement each other perfectly. 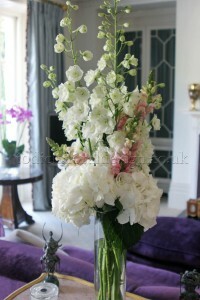 used or added; pretty pink varieties look lovely in light blue vases or jugs. Delicate delphiniums, which come in a variety of colours are great for adding height (pictured in white), and daffodils can be a simple option for table centres too, since they can only be used alone. Consider using them planted in pretty pots, having single stems in individual vases running the length of tables, or grouped at the centre if tables are round. With Todich Floral Design, which specialises in wedding flowers and bridal bouquets for London and the surrounding area, clients receive a complimentary consultation at a location of their choice, expert advice, bespoke designs, a wide selection of decorations, props and containers to choose from and the best wedding flower delivery in London and UK delivery throughout the week and weekend. We can take care of everything for you; so book your FREE consultation, sit back and relax. Todich Floral Design wedding florist in London provide flowers for all seasons and types of event, from winter wedding flowers and Christmas decorations for offices and hotels, to private summer parties, baby showers and corporate events. To find out more, simply call Todich Floral Design on 020 7737 1166 where one of our friendly florists will be on hand to help.